If we can’t kill the NEG, can we at least shape it into something useful? The National Energy Guarantee can possibly be made to work – to improve the reliability of power supplies, to reduce emissions, and to reduce people’s power bills – but not in its present form, writes Ian McAuley. AS THE NEG is presently drafted, its main objective seems to be to halt the transition of Australia’s electricity sector to renewable energy, on the basis of two false assumptions. These assumptions are that there is an inescapable tradeoff between affordability and reducing emissions, and that renewable sources are intrinsically less reliable than “base load” generators. People are concerned about rising power bills. 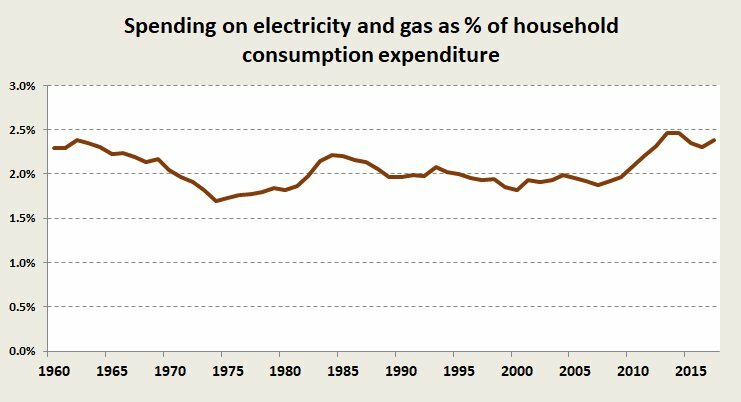 The figure below shows that as a proportion of household expenditure, Australians are paying much more for energy than in the recent past. After twenty years of relative stability, expenditure on electricity and gas has risen by 0.5 per cent of household expenditure. That equates to about an extra $400-$450 a year, which is tough at a time when most incomes are stagnant in real terms. 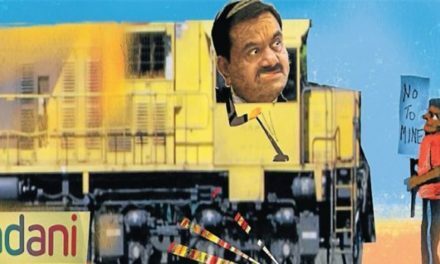 We know the sources of that higher expenditure — mainly “gold plating” of the transmission system, exploitation of market power by “gentailers” (firms operating at both the retail and generation end), and the bureaucratic costs of the monster called the “National Electricity Market” (NEM) with its contrived structural separation. There is certainly capacity to reduce people’s electricity bills. Modelling by the Energy Security Board leading to the assertion that the NEG may lead to people’s bills falling by $150 a year (in the distant future) is opaque, but it seems to be based on the absence of any change in consumers’ behaviour, and on the absence of any reform of our present electricity pricing structure, which perversely results in the highest prices for those who use least electricity. In simple terms, if we want to see a reduction in our electricity bills, we should use less of it, and shift our demand to those times when it is most plentiful — particularly when the sun is shining in the middle of the day. But our present tariff structures and some behavioural biases work against such solutions. 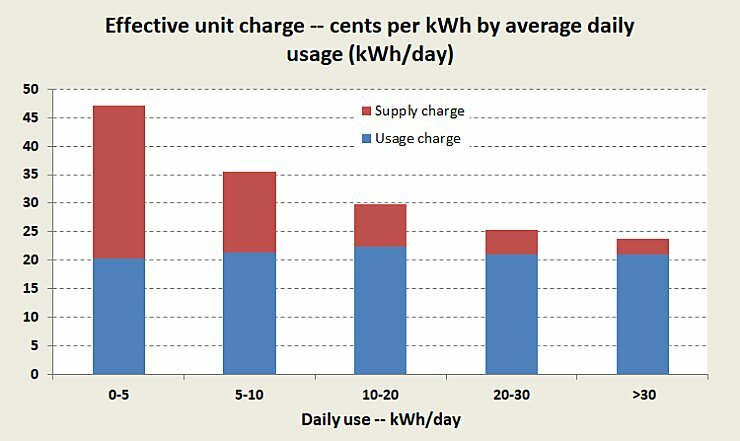 The figure below, derived from published ACCC data, shows that because we have a two-part tariff for electricity – a daily supply charge imposed regardless of use and a charge based on our use – those households with the lowest demand are paying the highest effective price per kWh. Everyone pays much the same price for each unit of electricity – around 20 cents per kWh – but the daily supply charge – around a dollar a day – is disproportionately loaded on to those with lowest demand, who also happen to be the most disadvantaged households. To draw an analogy with running a car, it’s as if the gasoline we buy at the pump is highly discounted, but we have to pay a fee to have the convenience of a network of service stations, regardless of how far we drive. Abolition of the supply charge and its absorption into a higher usage charge would send a strong price signal to large users, helping reduce total energy usage and therefore total emissions so long as we have fossil fuel generators. It would help those most in need and would reward those taking responsibility for reducing their consumption. But the NEG does not embody such reforms. What counts is not only how much electricity we use, but also when we use it. Demand at peak times (around early evening) drives the need for reserve capacity, and demand at nighttime drives the need for what is known as “base load”. The ACCC in its recent report on electricity affordability stresses the need for an appropriate consumer response to match supply and demand, but it points out that present tariff structures and a lack of consumer engagement both tend to thwart any response that would result in a shift and reduction in demand. 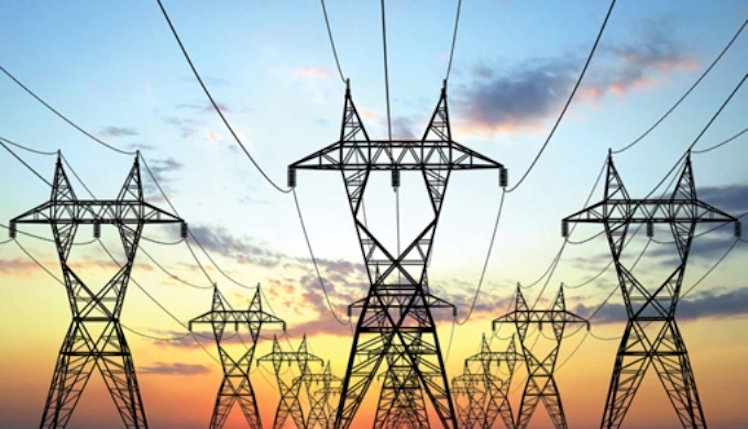 A more intelligent tariff structure would see cheapest electricity in the middle of the day, and higher tariffs at what are presently peak times. Technologies to allow such responses, from simple mechanisms to turn on a dishwasher at a predetermined time, through to smart internet-connected mechanisms that adjust the load of energy-intensive appliances without any loss of convenience, are rapidly coming on to the market. But such a response requires improvements in metering. Again, to draw the analogy with running a car, the way most of us buy electricity is akin to finding that there are no displays of price or litres delivered on the pumps we use at service stations, but rather that each quarter we get a bill from the Caltex or Shell for our use. Some states are ahead of others in terms of smart metering, but the rollout has been far from elegant, with inadequate attention paid to consumer benefits. The government, in pushing the NEG, is using the same deliberate obfuscation, talking about dollars a year (the size of one’s bill), rather than cents per kWh (the unit price), as if consumers are incapable of responding to price signals. On Thursday, in an interview with the ABC’s Fran Kelly, Morrison, never noted for clarity, said that the NEG “will bring prices down by $150”. Go figure. The other necessary aspect of engagement is to see people making sound investments in reducing electricity consumption. Very simple outlays such as door seals and replacing CFC lights with LED lights have rapid payoffs. Roof insulation, replacement of old appliances, and double glazing also have reasonable payoffs — sound savings generally far better after-tax returns than can be found on the stock market. It won’t be long before batteries become attractive investments for those who have realistic expectations of after-tax investment returns. What goes for households also goes for businesses. If businesses were really concerned with reducing their power bills, rather than engaging in partisan opposition to any policies with a “Labor” or “Green” label, we may see them responding to opportunities: distribution businesses covered their warehouses in panels, bakers making bread in the middle of the day, and rural enterprises going off-grid with their own solar and wind power. 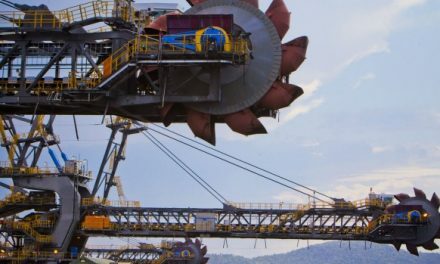 Certainly a bunch of new coal-fired “base load” stations, as some in the Coalition are seeking, would be reliable for a few years, but at a terrible price, both financially and environmentally. It beggars belief that at a time when climate change is unleashing its savagery in a severe drought and mid-winter bushfires any politicians, particularly those who claim to represent rural electors, can demand that Australia stop our so-far pitiful contribution to reducing greenhouse gas pollution. Unfortunately, the demands made by Abbott and his colleagues are so extreme that they convey the impression that the NEG, with its 26 per cent emissions reduction target, represents an environmentally responsible aspiration, and journalists are tending to present it as a reasonable compromise. But as an aspiration it’s pathetic: we’re already close to meeting that target, and with projects currently in train will probably exceed it in a year or two. (At the time of writing, 3.30 pm on Thursday, renewables are providing 27 per cent of the NEM’s electricity.) The NEG as it currently stands means that for most of the period up to 2030, our electricity sector will do nothing towards meeting our climate change commitments. Frydenberg, burdened with the task of selling a bad policy, at least is talking about “despatchability” rather than “ base load”, but the idea of “base load” electricity still dominates discussion. Under any realistic scenario, however, including Labor’s 45 percent reduction, there will still be enough power for 24/7 operations in aluminium smelters, street lighting and hospitals. Wise use of hydro resources, supported by appropriate pricing, will help maintain despatchability, as will small and large battery systems and short-term storage such as hot salt. Those who seek to devalue renewable energy, harp on about the unreliability of wind and sun, but, as the Australian Energy Market Operator (AEMO) points out, Australia is a large country, with clean energy zones in regions with different weather patterns and which are affected by fronts moving across the continent hours or days apart. A well-connected set of high-voltage DC transmission lines, linking wind, solar, geothermal and tidal energy could provide enough geographical hedging to satisfy even those seeking “base load” power. Investment in such power lines would be a far better use of public funds than the planned additional subsidy for coal-fired stations in the present version of the NEG. Can our legislators take what’s best about the NEG and shape it into something that will serve its claimed purpose? Or is Turnbull locked into a “take-it-or-leave-it” standoff with Labor state governments and the Labor Opposition? Turnbull would, and should, do much better, by not only outing the prejudices and folly of Abbott and his mates, but also by negotiating directly with Opposition Leader Bill Shorten, in our national interest. Is he up to it? The above article appeared in Pearls and Irritations and is republished with permission. PreviousBig business: stop robbing my Mum!